The United Nation must be concerned by the disturbed Post-Electoral situation in Uganda especially when political refugees from Uganda start to move out of this troubled country into Europe and the American countries again! Written by the Observer Media Ltd. Statement from United Nations High Commissioner for Human Rights and Political Refugees spokesperson, Cécile Pouilly, dated February 23, 2016. 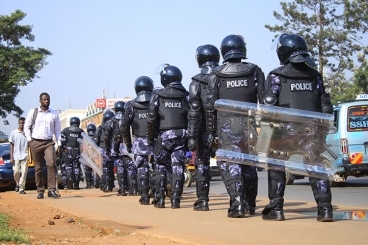 We are concerned by the tense post-electoral situation in Uganda, with reports of at least two people killed and an unknown number of people injured, heavy military and police forces deployed in the streets of Kampala, and the arrests of four opposition leaders since Thursday’s elections. Mr Kizza Besigye, leader of the FDC (Forum for Democratic Change), who was arrested and released on three different occasions last week, was placed under house arrest on Saturday without charge or judicial order. Yesterday morning, he was taken to a police station in Nagalaama, a town located some 30 kilometres from the capital Kampala, after he tried to leave his home. Two other presidential candidates have also been reportedly arrested over the last few days. Amama Mbabazi, from the Go Forward party, has been under house arrest since Saturday, while Abed Bwanika, President of the PDP (People's Development Party), was reportedly intercepted by police on Friday at Mutukula, close to the border with Tanzania, as he was attempting to leave the country with his family. Kampala’s Lord Mayor, Erias Lukwago, was also arrested on Saturday, as he was talking to the press about Mr Besigye’s arrest. We are also concerned about the intimidating display of force used on Friday by Ugandan police and military forces to evacuate the FDC headquarters in Kampala, with tear gas and life ammunition reportedly used, and by worrying information of journalists being harassed and intimidated by security forces. We remind the Government of Uganda of its obligations under international human rights law not to unduly restrict freedom of expression and peaceful assembly. Law enforcement officials shall avoid the use of force or, when that is not possible, restrict it to the minimum extent necessary. Anyone who is arrested shall be informed of the reasons for the arrest and shall be promptly informed of any charges against him or her. One cannot blame this organization for such a statement. This is an International Organization that is seen too much Global Immigration of innocent victims of worn torn countries all over the world. Modern rulers of the Dictator type seem to have run out of money to spend on productive employement for their citizens as they continually invest the countries' resources in staying put in power until the end of their lives. The citizens on their part vote with their feet and move out of this social and political predicament. One cannot blame commercial agents who deal in transporting such human suffering from point A to point B! Kampala. The Electoral Commission (EC) chairman, Dr Badru Kiggundu, was yesterday unwavering that the February 18 polls were credible, free and fair despite wide condemnation that the exercise did not meet minimum standards of an election. 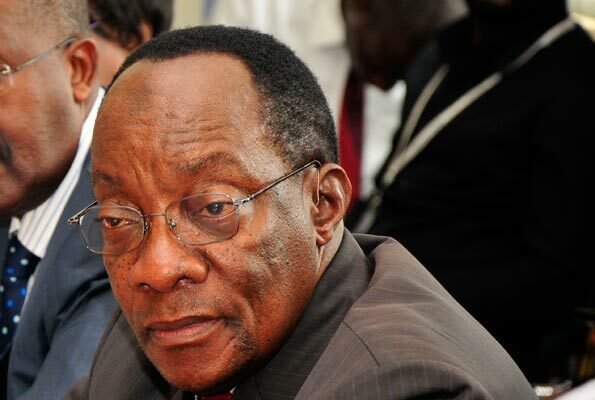 Mr Kiggundu, who was addressing the country ahead of today’s Local Government Council elections, first reacted to what he called “distortions of information” on the manner in which the results were declared. “It is important to note that the declaration met the legal requirement of Section 57(4) of the Presidential Elections Act, which provides that a candidate shall be declared as president if he/she has obtained more than 50 per cent of the valid votes cast at the election,” Dr Kiggundu said. He added: “The candidate who was declared as winner had obtained more than 50 per cent of the total votes cast at the election. The commission considered the fact that the difference in votes obtained by the leading candidate and first runner up would not be overturned by the votes from the remaining polling stations,” he said. Both international and local observer missions including the African Union (AU), European Union (EU), the Commonwealth, the Electoral Institute for Sustainable Democracy in Africa (EISA) and Citizens Election Observer Network Uganda (CEON-U) queried the credibility of the electoral process raising issues surrounding voter bribery, an unlevelled playing field, late delivery of materials, intimidation and harassment, among others. On the allegation that the EC deliberately declined to declare results from areas which support Dr Kizza Besigye, the Forum for Democratic Change candidate, Dr Kiggundu said all the results which came in at the specified tallying period were declared. Also, the EC yesterday released what it called the final tally of the presidential elections excluding 129 polling stations whose results were cancelled due to various malpractices including disruption of the voting process according to Dr Kiggundu. Some of the affected areas were Ggaba, Makindye Division and Kyebando Sub-county in Wakiso District. President Museveni, who was declared winner, had according to EC, 5,971,872 (60.62 per cent) followed by Dr Besigye with 3,508,687 (35.61 per cent) Mr Abed Bwanika of the Peoples Development Party polled 89,005 (0.90 per cent) of the valid votes cast. Independent presidential candidate Amama Mbabazi got 136,519 (1.39 per cent), Prof Venansius Baryamureeba 52,798 (0.54 per cent), Farmers Party of Uganda’s Benon Biraaro at 25,600 (0.26 per cent), Joseph Mabirizi at 24,498 (0.25 per cent) and Ms Maureen Kyalya at 42,833 (0.43 per cent). In response to Dr Kizza Besigye who has more than once been arrested on his way to the EC to, among others, get the results for the presidential polls, Dr Kiggundu, said the FDC presidential candidate had gone about the matter in the wrong way. The commission also dismissed reports that the weakness of the EC, especially the failure to deliver voting materials on time, could have contributed to many people not voting. “A voter turn up of 67.61 per cent and you think that is incompetence of the EC? Even in mothers of democracy, heads of state come to office at 50 per cent. If people could be in multitudes which you were seeing on rallies, you as media why didn’t you convince them to come and vote, we think a voter turn up of 67.61 per cent is not a small one and shouldn’t be demeaned,” Mr Joseph N. Biribonwa, the deputy EC chair, said. On alleged pre-ticked ballot papers, Mr Biribonwa said the commission was still in liaison with the police. “The matter is with the police, we are waiting for them to produce the exhibits and we ascertain whether they are our ballot papers or not. They could have been fake papers, I don’t want to say they were not ours but we are waiting for the police report to come out,” Mr Biribonwa said. EC has also postponed the KCCA special interest group councillors elections following a court order blocking the same. “There was an injunction which put on hold these elections by one or two of the professional groups, so we couldn’t proceed with the others but when the matter is resolved we shall hold these elections,” Mr Biribonwa said. The lame-duck government of Uganda has been faulted on its continued relations with North Korea as it struggles to stay put in power. Uganda has been listed among the top five countries in the world that have defied the United Nations sanctions against North Korea and continued military cooperation with ostracised Pyongyang. A report by the Royal United Service Institute for Defence and Security Studies, a global security think tank released last month, lists Uganda among the countries that seem not ready to cut the ties with North Korea despite UN restrictions. “…the number of state and non-state actors purchasing arms and related services has continually dwindled since the end of the Cold War. 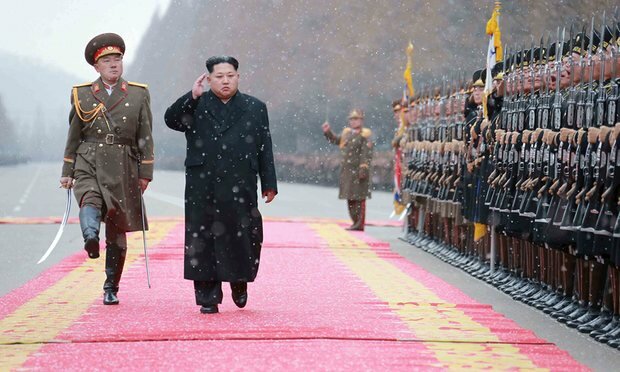 However, Syria, Iran, Uganda, the DR Congo, Burma and Cuba have been steadfast, continuing to contract out to Pyongyang for arms and related material and services in spite of taboos and legal restrictions against doing so,” the report reads. The report also mentions training of Uganda police in Kabalye, Masindi and the repairing of UPDF small arms in Nakasongala by North Korea as areas of cooperation that are against the UN embargo. However, Mr James Mugume of the Foreign Affairs ministry and a permanent secretary said yesterday North Koreans were only repairing weapons bought before sanctions. North Korea has been training police in marines and marksmanship. They also train UPDF in artillery, air defence and para trooping in Nakasongola. Mr Mugume said the North Koreans are training UPDF on how to maintain the equipment. North Korea is currently facing new proposed sanctions pushed by China and the US last week, following its test of nuclear and the long range missile last month. Some African countries including Tanzania have cut military ties with North Korea as pressure from the UN but the report says Uganda continues to be defiant. “Kampala’s defiant response to recent questions [by the UN] and criticisms surrounding DPRK [Democratic People’s Republic of Korea]–Uganda co-operation is indicative of its determination to maintain strong political and probably military ties. It has explicitly said that it will not abandon its ties to North Korea as a result of sanctions or pressure from the UN,” the report says. Kibaale District and NFA officials inspect part of the forest reserve last week. 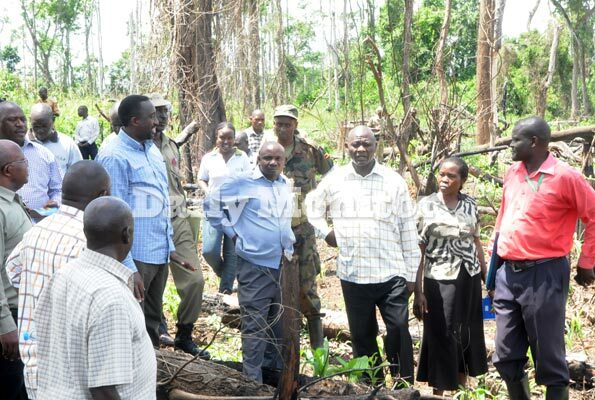 A total of 624 families are stranded after they were evicted from Kangombe Forest Reserve in Kibaale District by the UPDF on the orders of National Forestry Authority (NFA). The eviction, which started last Wednesday, leaves more than 2,500 people homeless with those evicted now camped at Muzizi Trading Centre in Nyamarunda Sub-county. Those affected are mostly residents of Karukarungi, Buhumuliro and Baghdad villages, where encroachers, especially of Rwandan origin, have been living. The Muzizi village chairperson Mr Emmanuel Kemerwa, said the UPDF soldiers forced out families many of whom have lived in the area for more than 10 years. “We request government to intervene since the High Court had suspended the eviction,” he said. However, the NFA sector manager for Kagadi, Mr Uzia Ndyanabo, said they could not just look on as the forest is being depleted, saying the threat on the forest had forced them to evict encroachers despite a High Court order. In 2014, High Court Judge Owiny-Dollo restrained NFA from evicting encroachers, until when the boundaries are opening up. However, the boundaries, according to affected families, have never been opened. Addressing the affected families on Monday, the Minister of Finance, Mr Matia Kasaija, questioned why the eviction had been conducted without effecting the court order. “We agreed that NFA should open up the boundaries before evicting people but now I hear even the army is inside the forest. Is that the way things are done?” he wondered. Mr George William Namyaka, the Kibaale District chairman, called for calm, saying “a solution will be found in a few days”.